A quick run-down on the settings of your camera. ISO - sensitivity of the image sensor. The bigger the number, the more sensitive the sensor. You will need a sensitive sensor in low light (night, interiors, theatre, etc.). You may also need to adjust your ISO up higher if you need a faster shutter/more depth of field and can't achieve it by changing shutter speed or aperture alone. By increasing your ISO, you are also increasing the amount of noise (coloured grain and speckles) in your photograph. *Refer to diagram below for the relationship effects of ISO, shutter speed and aperture. Shutter speed - the amount of time the sensor is exposed to light. The speed at which the shutter opens and closes to allow light into the camera to expose an image on the sensor/film. 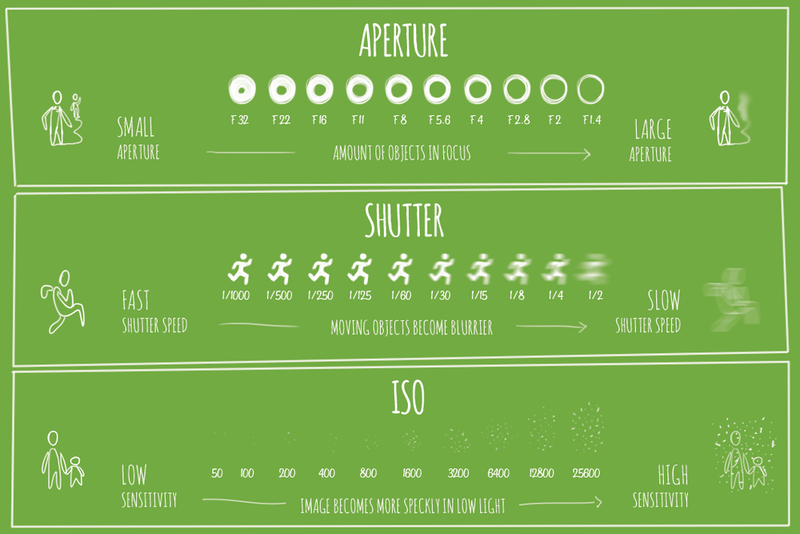 *Refer to diagram below for the relationship effects of ISO, shutter speed and aperture. Aperture (f-stop) - the hole in the lens through which light travels. This hole can be made larger to allow more light to enter the lens or made smaller to stop light from entering the lens. The bigger the hole, the more light that is let in, but the fewer things that are in focus. *Refer to diagram below for the relationship effects of ISO, shutter speed and aperture. Shutter Priority (S, TV) - you select the shutter speed and camera selects best ISO and aperture. A person with the moon - slow shutter speed allows some of the natural light to be recorded in the photograph. No more black emptiness behind a flash lit person. Fill flash illuminates the nearby object of focus. WB (white balance) - select the colour of the light you are shooting in. Yes, light has a different colour. Fluro is different to bluer than a bulb. A bright blue sky day has warmer light than a cloudy day. The quality of the image you are photographing. RAW keeps all possible information that your camera can record. This is why sometimes a RAW file can look flat - it's leaving tone up to you and not clipping any light or dark information. Always the best option as long as you have editing software. You can not print a RAW file. TIFF - next best quality. If you have editing software, you can open and save this file without degrading the quality. You can also print directly from this file type. JPG - smallest file size but you lose information (aka quality) each time you open, adjust and save the file. JPG can have multiple setting also. Fine, Normal and Basic. Fine being the best quality JPG and Basic being the least. JPG is good for when you don't have editing software, don't have much space on your memory card or need to photograph quickly. BEWARE - jpg quality does not have the dynamic range of larger file sizes (TIFF or RAW). It can also crop the number of pixels the camera is using to photograph. If you want to enlarge your photos, photograph with the highest quality setting you can. As the saying goes, "better to have too many than not enough". I've put together a diagram for you, to help you understand the relationship of ISO-APERTURE-SHUTTER SPEED. When one is changed, the others change. This is important to know when you start playing in Manual mode. It will also give you a reason to go into Shutter Priority or Aperture Priority. What are the characteristics of each lens and when would I use it? Fixed lens or zoom lens? Zoom lenses are great as they give you options within the one lens. Normally you have to pay for a pro lens if you would like a fixed aperture of f2.8 at each zoom length. This means you will be able to photograph with lovely 'blurry' bokeh whether you are at 28mm or 70mm (using my 28-70mm f2.8 lens as an example). It also means you won't need to change your settings if you zoom in. Consumer priced lenses have a variable aperture. As an example, if you have the Nikon 18-105mm zoom lens set at 17mm you will achieve an aperture of f3.5. However when set at 105mm the aperture can only get to f5.6. f5.6 means you will have more things in focus, need more light, or have to change shutter/ISO to get the right exposure. Fixed lenses are great as they give you a fixed aperture and can be a lot cheaper and lighter than the zoom lenses. One of my favourite lenses is the Nikon 50mm f1.8. Very often it is the only lens I take on holiday. Being a fixed lens, this means you have to use your feet to get closer or further away from the subject. It can cause problems if you are in a small room, on a cliff or any other situation where you can't move. It is in this situation that you call creativity to strike! * Digital zoom is a no-no - don’t use it. By using the digital zoom, you are cropping pixels out of the image. By cropping pixels out of the image, you are degrading the image and image size. I have tried all settings and typically settle on Manual. When I worked at the newspapers I would use TTL and find that the exposures were all over the place. Backlit subjects were the hardest for it to measure. I'm sure the technology has come a long way since then. However I still feel the pain and stay with Manual. Each speedlight is different, so I'd recommend reading the manual for full specs. Manual - you control the amount of light that is pushed out. TTL - Through the lens. The camera and flash get intelligent and work out what you need. You can force it to under and overexpose by using the plus and minus power buttons on the speedlight. I use this for social photos sometimes, when light and circumstances aren't changing an awful lot, but my distance to people is. And, of course, I have to work quickly, so don't have much time to worry about settings being perfect. Auto - well, the camera and flash make all the decisions for you. Tricky for them to get right sometimes if you are in a bright or overly dark situation. Work out what camera you need (majority of time) for what you want to photograph. Let me know what you have chosen and why on Facebook. Tell us what sort of photos you plan to take with it. While you are in Facebook, let us know what you photograph and why. Let's see where and what everyone is doing.